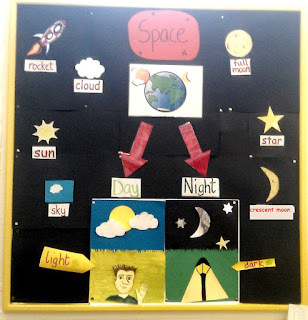 Senior Infant Adventures in Learning: The Sun, Moon and Stars! Sorry I haven't blogged much recently, but things have been busy enough in school over the past while - not that that's a bad thing in terms of content coverage! We discussed features of daytime and nighttime (sun, moon, stars, light and dark colours, people who work during the day and those that work at night, etc) and completed the above poster as they named the various features. We discussed how the sun is still around during the day even when it is cloudy. We discussed how we are never in total darkness because of the moon and stars. We also created night and day pictures. 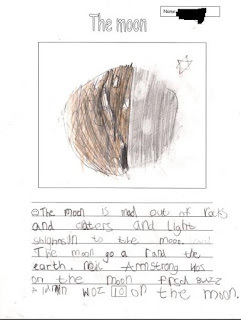 The following day, we learned about how the earth rotates and how this causes night and day. We pretended we were the earth as we all held hands in a circle. One child held the Irish flag (they were Ireland) and the other children were other countries in the world. 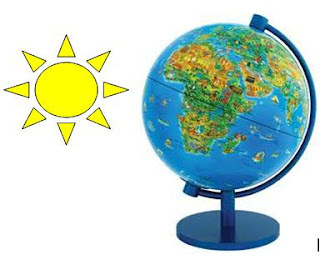 One child held a flashlight (facing the child holding the Irish flag) and pretended to be the sun shining on the earth. They started by shining it on Ireland and I got everyone to rotate around, as the earth does as the day passes. I told the girl playing 'Ireland' that when she could see the sun, she would shout out daytime. When she could not see the sun anymore, she would call out nighttime (as it is now dark in Ireland, with no sun). We then did the same thing with a globe to check whole class understanding. We stuck a sticker on Ireland on the globe and we all shouted out daytime when the sun was shining on Ireland, and nighttime when it wasn't. We discussed the first moon landing. We brainstormed things we knew already. We then looked at a PowerPoint which told us about the first people on the moon. We watched some Youtube videos of the moon landing and talked about how the moon was different to earth. They then wrote about one thing they had learned about the moon landing. 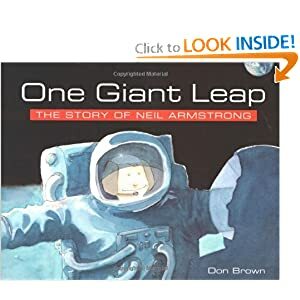 We also read a story the following week on Neil Armstrong's life. We discussed this and created timelines of his life (What Armstong was doing as a child, as a teenager and as an adult). 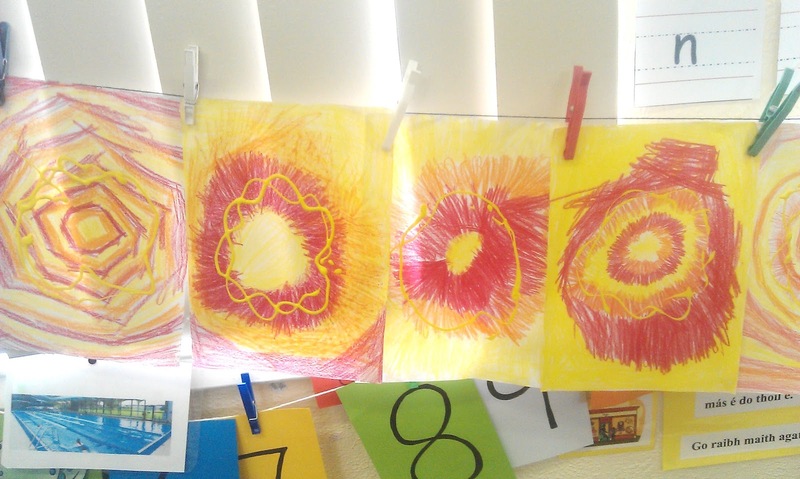 We created blazing suns. We talked about colours in the sun, how it is too hot to land on (unlike the moon), and general sun safety (you can't look at it in the sky, you need to protect yourself from the sun, etc). 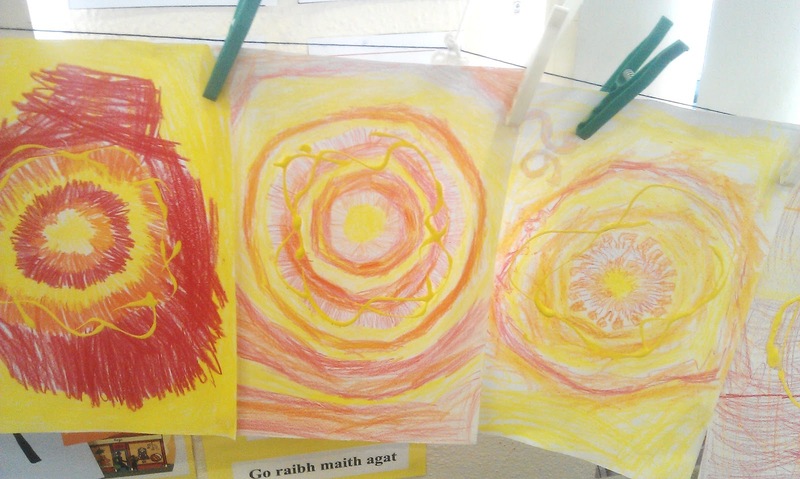 We used crayons in yellow, orange and red to create the suns on A4 pages. We used a squirty container to squirt yellow paint around the center and then repeated this by mixing more yellow paint with PVA glue and glitter. We focused on the sounds: 'igh' and 'oo' and following various activities and a lot of practice in reading words containing these sounds, they were included in our morning messages each day e.g. we are talking about the moon today, we are learning about day and night, we are making a moon today, we are dancing to high and low music etc. We sang the song See-Saw (The Right Note) and pretending we were on a see-saw, we went up and down to accompany the high and low notes in the song. We then listened to pieces of music 'The Elephant' and 'Dance of the Sugarplum Fairy', talked about the music, whether it was high or low pitched and responded to it through dance. I sang high and low notes to them and they showed whether it was high or low by bending down low or going up high on their tip toes. I asked individual children to do this also. 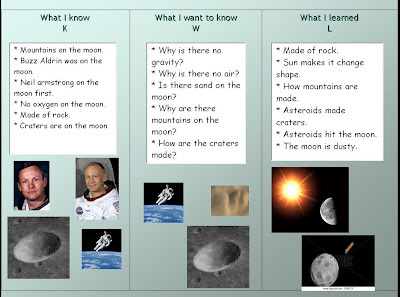 We created a KWL chart of what we had learned about the moon so far and what else we wanted to know about it. We played an interactive game on http://www.earthsunmoon.co.uk/. 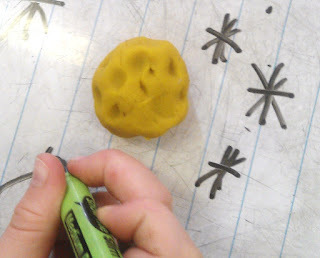 We discussed through our playing of it, how craters are made, how mountains are made, how the moon moves around the earth and how the moon changes shape and what shapes it makes. We noted what we learned on the KWL chart and then created mini-moons from playdough. 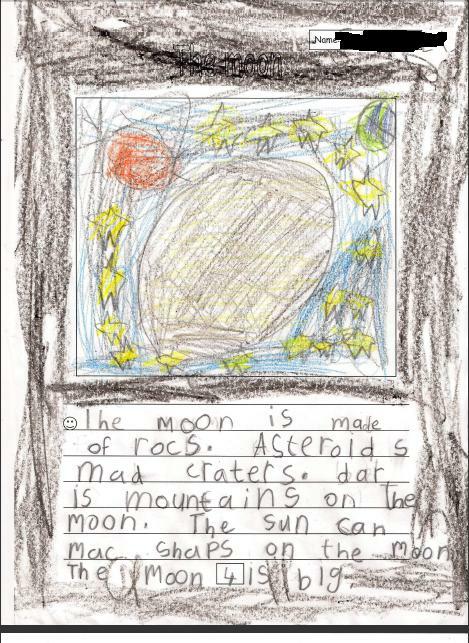 We used what we learned about the moon to write a class non-fiction book about the moon. We looked at some non-fiction texts and talked about things that make a non-fiction text different to a storybook. 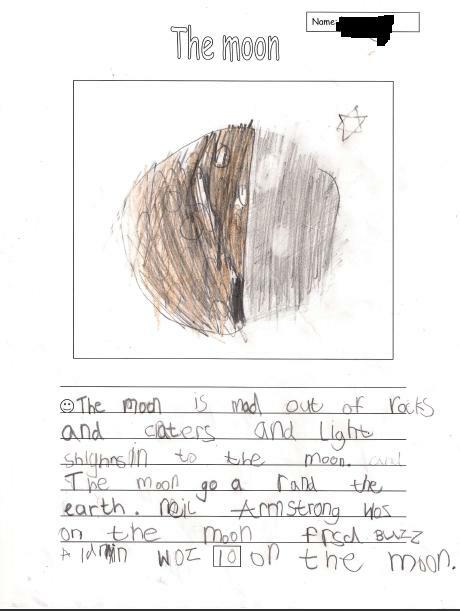 They then drew a picture of the moon on a template and wrote some facts about the moon that they had learned over the past couple of weeks. We numbered the pages, created a contents page and added a coverpage to our book to complete it. It was then placed in the class library for reading. So that's what I've been up to for the last two weeks, happy teaching!